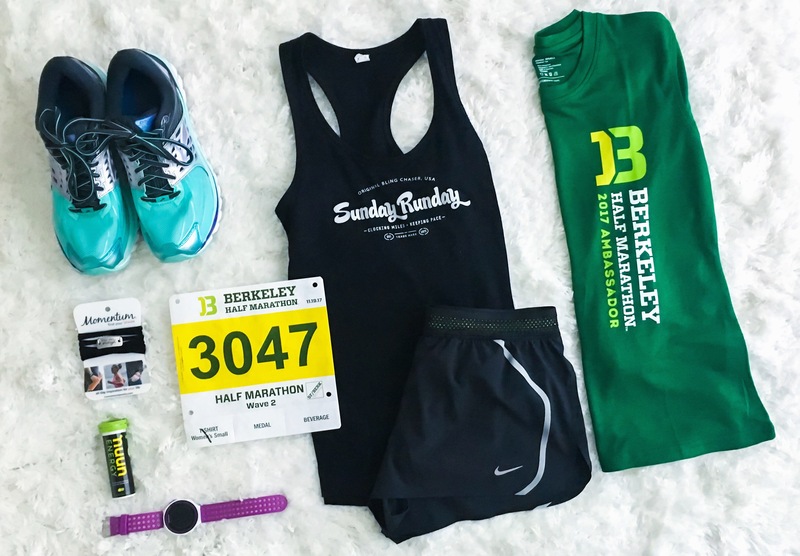 Runners were given the option to either pick up bibs in person or pay a small fee to receive bibs in the mail. I chose to go to the expo but would definitely recommend paying for the mail option in the future. Don’t get me wrong, I love going to race expos but the stress of dealing with parking was not worth it. The expo was at the Berkeley Sports Basement where there is unfortunately little to no parking. I drove around the blocks a few times and eventually waited in the parking lot for about 10-15 minutes until someone left. Parking was easier than bib pickup was but make sure to get there early. Berkeley High School charged $20 for parking (yikes!) but hey, you get to park right next to the start line. It was a cold morning but perfect weather for a run. 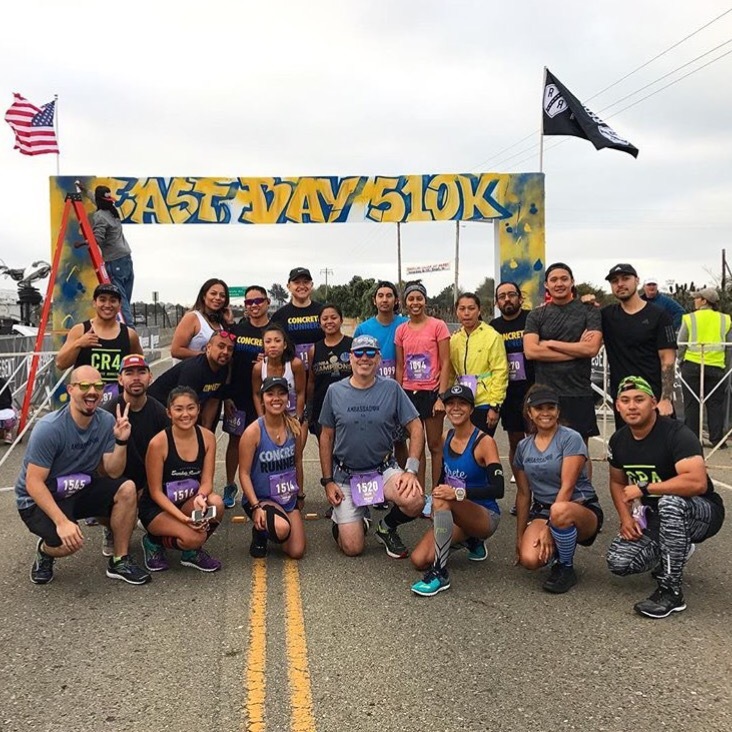 The porta potties were plentiful, the corrals were well-organized and the race started on time – couldn’t have asked for a better race start! There were definitely more hills than I planned for, hence my soreness. The good thing was that with every uphill, there was a pretty significant downhill that followed. My legs hate me for going hard on the downhills but I wouldn’t have made the PR if I hadn’t. Other than the hills, the course was cool and you get to experience all of Berkeley. Earned my race medal AND my challenge medal for running both the San Francisco Marathon and the Berkeley Half Marathon. BLING BLING! I have to say the medals were definitely worth it. I skipped most of the other post-race stuff to cheer on friends instead but definitely made sure to grab my post-race beer! Pro tip: Berkeley also has a ton of great restaurants so make sure to do your research before hand. 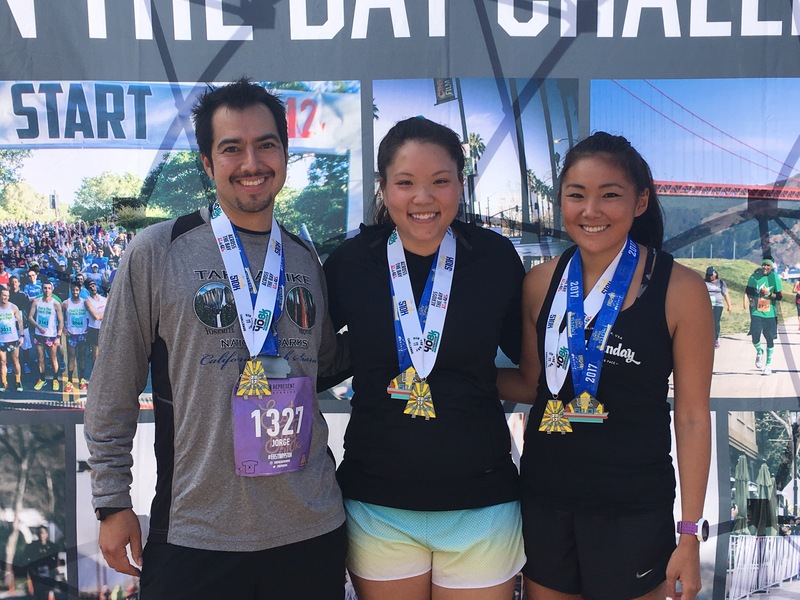 Yay, officially completed the Run The Bay Challenge (San Jose 408k, Across the Bay 12k and East Bay 10k)! Check out my review and be sure to mark your calendars for this series in 2018! Bib pickup was extremely easy and quick. 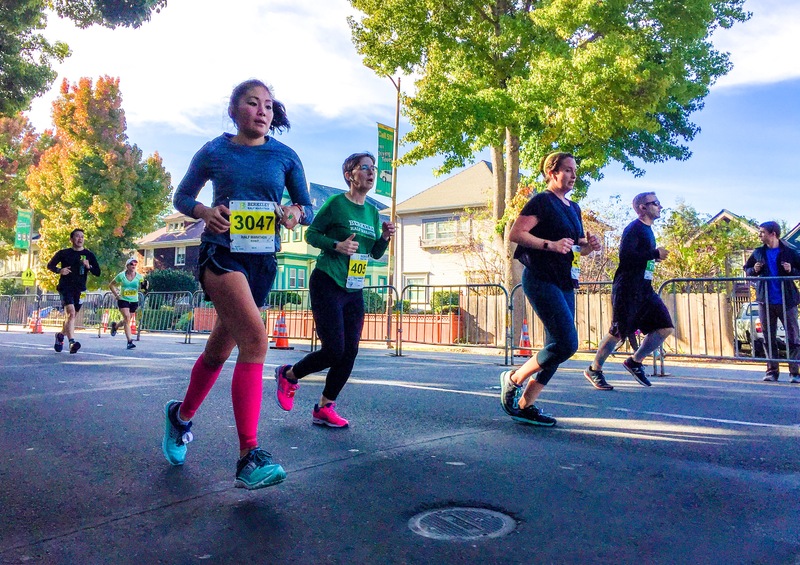 The pickup locations were hosted at multiple Sports Basement locations around the Bay Area so it was convenient to choose the one closest to you. Parking was easier than bib pickup was! The race started at 8:05 AM so we arrived at 7:00 AM and parked in the IKEA garage as the race instructed us to do. There were many parking spaces and we had more than enough time to board the shuttles to the start line. We met up with the Represent Running crew at the start line because we had to get our pre-race picture first, duh! 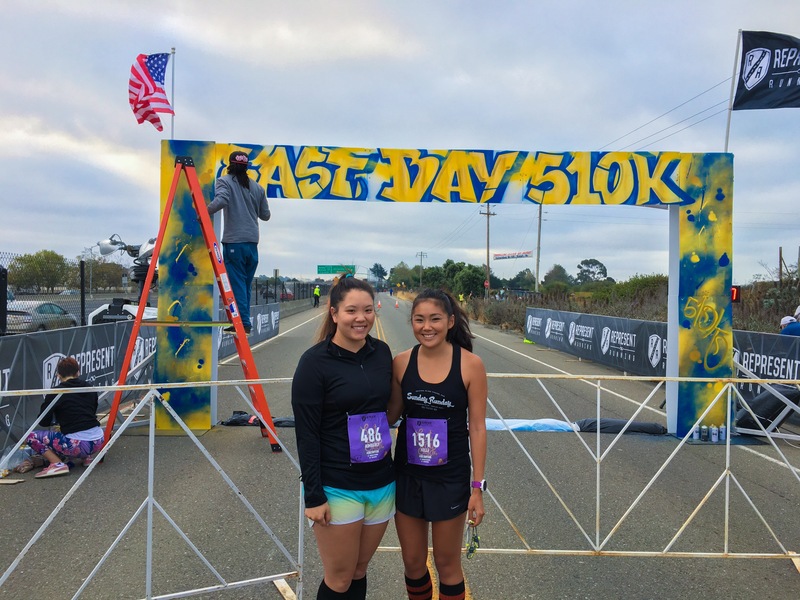 But also, if you check out the start line signage behind us in the picture, you’ll notice that it is being designed THAT morning. SO COOL, major props for a totally unique idea! Well I can’t say it was the easiest 10K that I’ve ever run, but did you really race if you found it to be easy? The race sets out on a dirt path at first.. careful here since there were many ankles that were rolled. Then you find yourself running next to the bay with views of San Francisco – very cool but windy. Shortly after, you’re running along 880 and then over the freeway into Emeryville. It was my first time running in that area so it was a cool experience. I set the bar too high on my first 10K so while I don’t expect to ever PR for a 10K, I did come in 2nd for my age group so I’ll take the victory. Can you say photo ops? There were a lot of places for an awesome post-race photo (#forthegram). There weren’t many vendor tents but we did get to go to IKEA for breakfast after the race.. so overall, it was a fantastic Sunday morning.